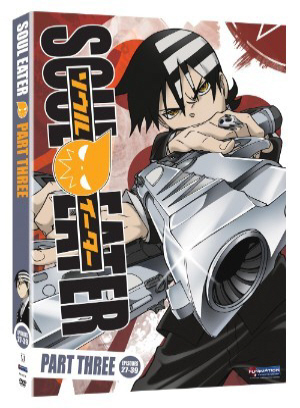 When it comes to delivering abundant doses of action and slapstick comedy, no anime can hold a candle to Soul Eater. The supernatural series about meisters and weapons working together at the “Death Weapon Meister Academy” to gather corrupt souls for the Grim Reaper has seen two previous releases of 13 episode installments, with part 3 being the most recent. Covering episodes 27-39, part 3 begins the final countdown toward the conclusion of the series. Picking up where the previous release left off, the DWMA is recouping after the culmination of the battle with Medusa and the Asura. The group begins picking up a series of mysterious occurrences in a small town, sending Maka and newly recruited Crona to investigate. There they encounter a plot to revive the long thought dead witch, Arachne. 800 years prior to the current storyline, Arachne had been defeated by the Grim Reaper, separating her body into millions of spiders to escape death. Over the course of her exile, she has accumulated a handful of powerful allies as well as a legion of followers. This coupled with her ability to create “demon weapons” puts her in a class above Medusa. Because of the impending danger, Doctor Stein decides it’s important for the students to prepare, teaching them to link their resonances with one another. Doing so has the potential to empower the group but only so long as they can get along, a fact Maka and Black Star discover the hard way. Elsewhere, Death the Kid is tasked with retrieving a magic weapon that Arachne’s group plan to steal, in the process discovering a conspiracy linking his father to the weapon’s creation. Compounding matters further, Medusa revives herself from apparent death, taking on a new form. Proving you can’t keep a bad witch down, she picks up the threads of deceit she had previously planted, forcefully recruiting Crona as a spy and pushing Stein further into madness. Everything comes to a head as the three sides clash over the mysterious weapon “Brew”. Much like the 26 episodes that have come before, this release sports some outstanding visuals. Studio Bones is known for their breathtaking animation and Soul Eater builds on that trend. As is per usual, Funimation offers another stellar dub that should warrant no complaints. Extras offer a similar helping of what has come before, with a series of comedic shorts, a cast and crew commentary, and the usual trailers for upcoming releases. Not a bad offering for an anime release. 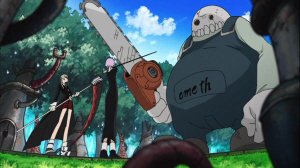 From the first episode to the last, Soul Eater continues to be just an incredibly fun series. There’s no shortage of unique characters, each with their own creative traits and the premise continues to push the boundaries of the imagination. If you’re looking for a deep, thought provoking viewing experience, consider yourself out of luck. Soul Eater isn’t that kind of show. However, if gorgeous animation and lively characters involved in amazingly detailed action is your thing, then consider Soul Eater the must see anime of the year. The fourth installment can’t arrive soon enough.